Fahrenheit 451 is a dystopian novel by Ray Bradbury about a future America where books are banned, and firemen start fires to burn books and any house caught with books. It's been a bestseller since its release in 1956. While you may have read the novel before, you may not know all the facts behind the novel. Here are five bits of trivia about this classic work of sci-fi. 2. Fahrenheit 451 Has Been Censored - In a painfully ironic twist, Fahrenheit 451, the book that deals with censorship, has itself been censored numerous times. Parents and Christian groups have objected to the profanity and depiction of Christianity in the novel. In 1967, the publisher Ballantine Books removed some profanity, as well as the word "abortion." Bradbury didn't find out about the changes until 1979, when one of his friends showed him the copy. Bradbury called the changes "mutilation" and demanded that his publisher restore his original version in 1980. 3. Fahrenheit 451 Is About Television, Not Censorship - According to Ray Bradbury, the novel isn't about censorship by the government at all. It's about the dangers of television. This may be a retcon since in a 1956 radio interview, Bradbury said that he wrote the story because of his concerns about McCarthy-era censorship and book burning. 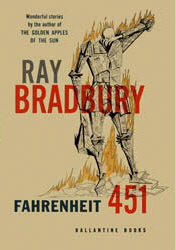 However, in 2007, Bradbury argued that Fahrenheit is about how television has turned people away from the written word. He points out that in the novel, the government doesn't take away books, but the American public simply stopped reading on their own. Book burning became a form of entertainment to the general public. His concerns probably came from the explosive growth of TV in his time. In 1945, there were fewer than 10,000 sets in the US. By 1950, there were six million. 4. Bradbury Wrote the Original Story for Ten Cents a Half Hour - Bradbury found his wife and children too distracting, so he went to the basement of UCLA's Powell Library to write. He used a pay typewriter that cost him ten cents per thirty minutes. It took him nine days and $9.80 to write "Bright Phoenix," the short story that he later expanded into Fahrenheit 451. 5. The First Fahrenheit 451 Was Fire-Proof - In what may be one of the greatest marketing gimmicks of all time, the publisher released a special first edition that's lined with asbestos. Two hundred copies of the book were bound in Johns-Manville Quinterra, a chrysolite asbestos material, numbered, and signed. The copies are much sought after by collectors with one retailing at $20,000. Later, in an homage to this edition, Stephen King requested a copy of Firestarter bound with the same material. BONUS: Fahrenheit Went Digital Against Bradbury's Wishes - Given Bradbury's concerns about the loss of great works of fiction, one would think he would welcome an electronic version of Fahrenheit that could be shared electronically and never burn. In fact, he was dead set against it. As late as 2010, Bradbury had turned down three companies, including Yahoo, that wanted to produce ebooks of Fahrenheit. He argued that society has too many machines, and his love of the printed page is well-documented. However, when the rights for the novel came close to expiring, the publisher insisted on getting the digital rights as well or the contract would lapse. Bradbury gave in, and Fahrenheit is now appearing on digital e-readers. What are your memories of Fahrenheit 451? Were you surprised by any of these details? Do you have any trivia to share? Let me know in the comments. Be the first to find out about my new releases by subscribing to my newsletter. Line with asbestos? Can you say bad idea? Didn't know it was actually about television. It's weird that it took him over ten years to realize his book was censored. I guess he doesn't read over his own work that much. I'm glad it did go digital since that's how I read it a month or so ago. Ironically the publisher disabled the Text-to-Speech option for it, so it's like they're restricting my freedom on a book involving restricting freedom. I think you can make the argument that it's about television as the main character's wife is a virtual slave to her TV as are most of their "friends." I remember reading this book in high school. I guess I can see where it could be a statement against television, though that is definitely not how it comes across in today's world (or even in the late 90's when I read it). That is probably due to the idea of books being illegal to own. Interesting stuff! I didn't know most of that info you shared.